Instant access to fast and intuitive dashboards to answer your key questions, and that for a very reasonable price. 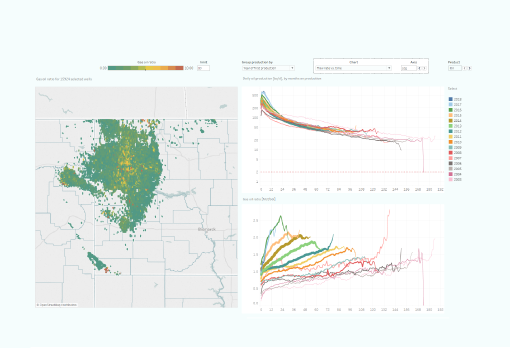 Subscribe to our data package and get access to our cleaned database with >100,000 horizontal wells in 12 US states. 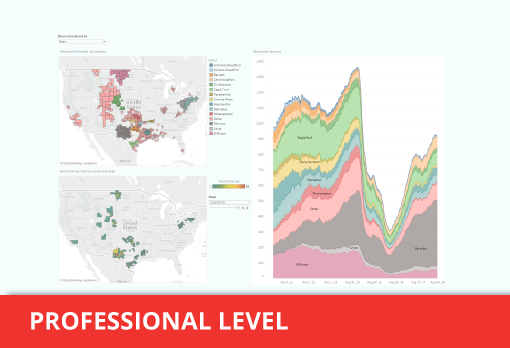 We have developed modern and intuitive dashboards with great visualization and analysis capability, to bring insight and help you answer key questions on the rapid developments in the shale industry. 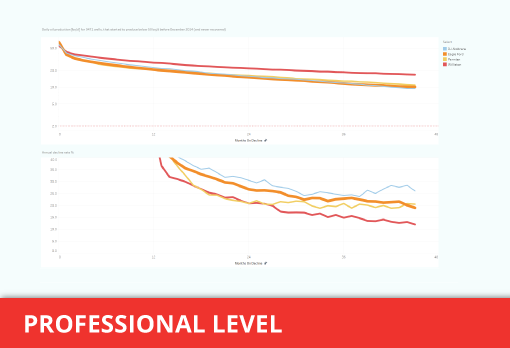 Whether you want to understand true operator performance, compare productivity profiles and changes over time, or understand what is really driving the increases in productivity (lateral length? Proppant volume? ): our dashboards aim to make it easy for you to analyze our data and get these key questions answered. 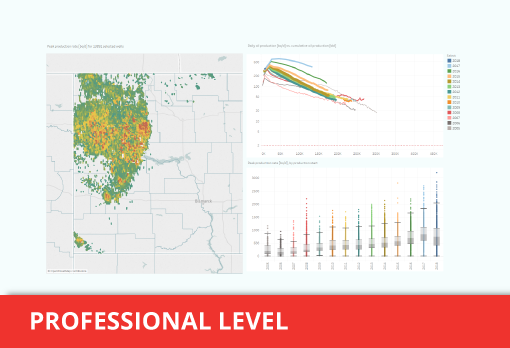 ShaleProfile holds detailed data from over 100,000 horizontal wells over 12 US states. With ShaleProfile Data we provide you an easy to download database that is always up-to-date with the latest data provided by the state agencies. 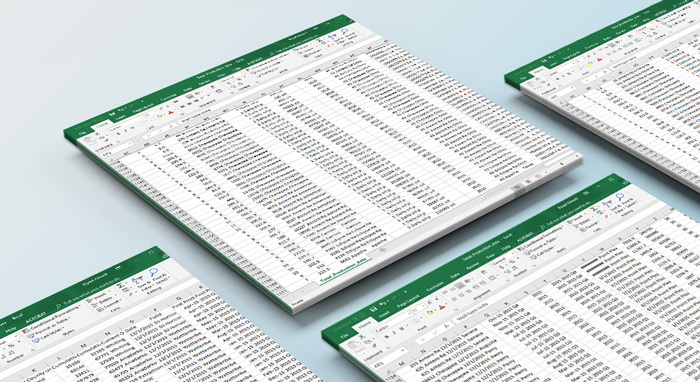 Cleaned and QAQC’d, with ShaleProfile Data we provide historical production data, location data (laterals), completion details, proppant volumes, and more. Get your first month for $19! 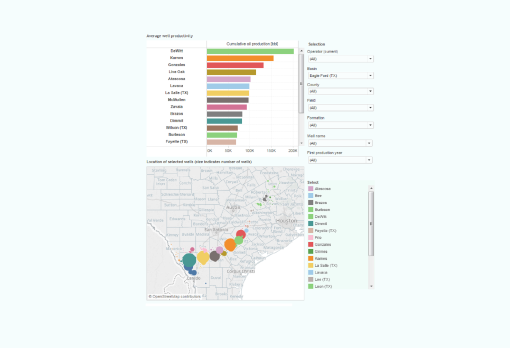 For companies who have their own BI tools and want to use our database for their analysis. Here you find the oil and gas production profiles for all horizontal wells. 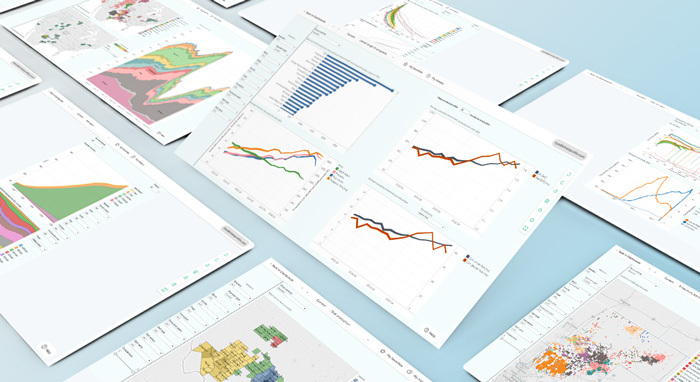 Analyze normalized well performance trends, or compare operators, formations or individual wells by selecting them on a map. Provides the same functionality as the "Production profiles" dashboard, but without map-based navigation and selection. It has more space for the graphs, and is slightly faster. 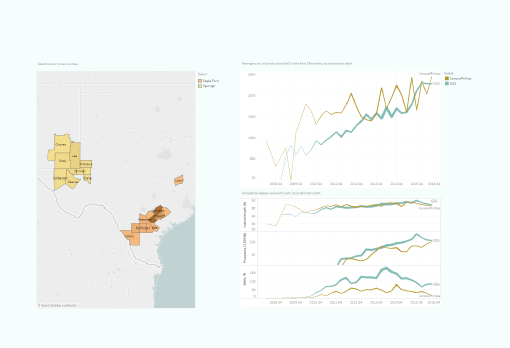 This dashboard answers the question as to how much oil and gas is produced in a certain basin, or by a particular operator, as well as the total number of wells that have started production. Provides the same functionality as the "Gas oil ratio map" dashboard, but without map-based navigation and selection. It has more space for the graphs, and is slightly faster. Reveals how well productivity is distributed, for e.g. each basin or operator. It also allows you to quickly find the exact locations of the best or worst performers. 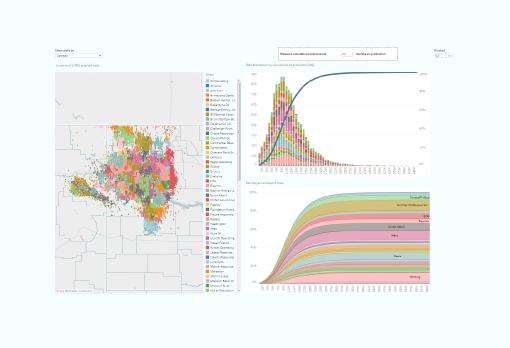 Find out what the largest operators are in a certain area, and see exactly how much oil and gas they have produced, and the location of their wells. 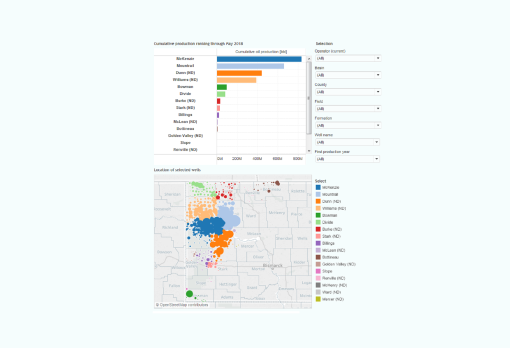 Can also be used for finding the top formations, fields, or counties. Shows how well productivity has changed over time, for example by basin or operator, as measured by the cumulative oil or gas production in the first x months. Professional users can also analyze the underlying trends in completion design (lateral length & proppant loading). Find out how the status of all horizontal wells has changed over time. Also contains a map with the latest status of each well. Presents a map with well locations, colored by their cumulative production until a certain month. 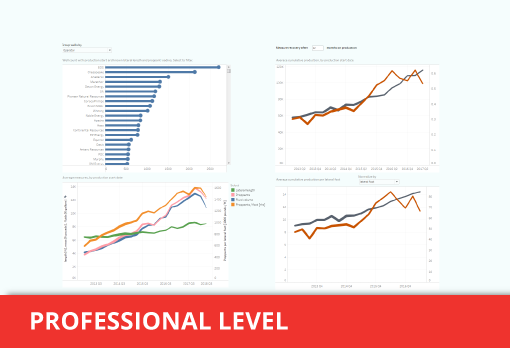 This allows you to easily identify the best performing areas. 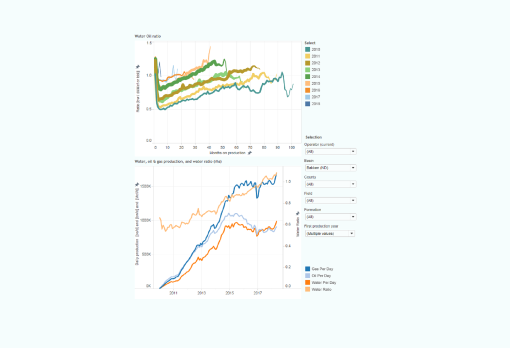 This dashboard contains a list where all wells, operators (or other dimensions) are ranked by their average well performance. Use it if you’re interested in locating the best or worst performers. 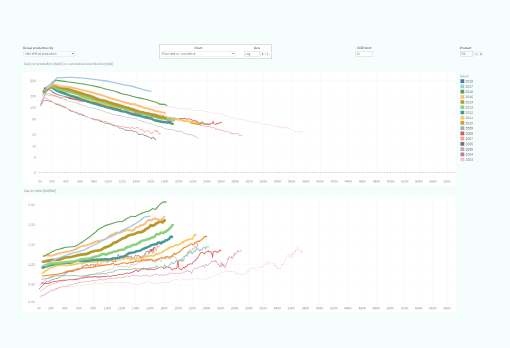 The water/oil ratio is shown for all selected wells, over time. 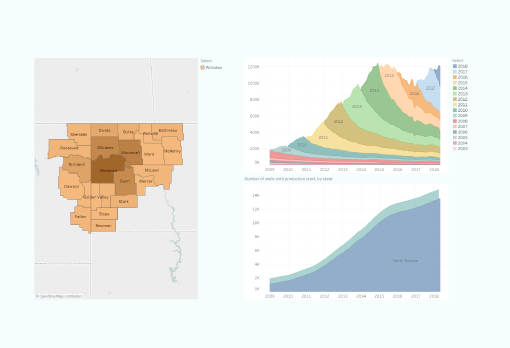 This dashboard allows you to determine the annual decline rate, after wells have fallen below a certain production rate from which they did not recover. 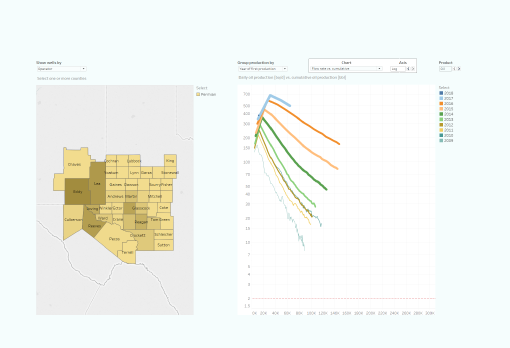 Gives an overview of the horizontal rig count, and it allows you to find where the hottest drilling locations are. Here you can analyze how lateral lengths and proppant loadings have changed over time, in a particular area and by operator. It also reveals what the impact of these designs have had on well productivity. A map shows the peak production rate of each well. A scatter plot helps you in finding the location of wells with the highest peak rates, and to see how peak rates have changed over time.